Jeanette Lee demonstrates The Spider at the BCA Expo. This patented billiards training aid teaches billiards (pool) players of all abilities how to make more shots. 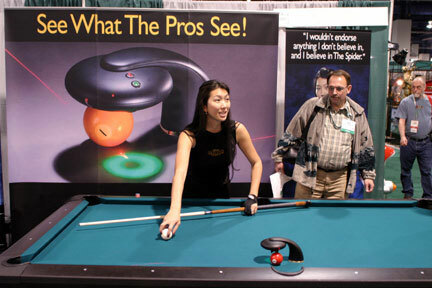 The Spider uses laser technology and illumination to teach the key concepts of billiards shot making while the person is playing pool, versus billiards training videos or pool playing self help books. 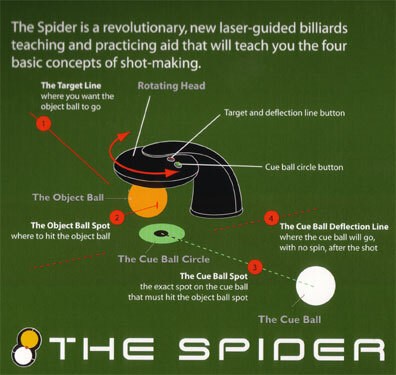 The Spider sits on the pool table and uses a series of pointing Laser beams to show you the exact spots for targeting, hitting and setting yourself up for the next play. You place a pool ball under the spider, then line up the target line laser with a pocket . An imaginary green ball (created by laser light shown on the table) shows you the exact path the cue ball must take to make the shot. A laser light also shows the exact contact point to make the shot. The tangent line is show with a second laser and allows you to see where the pool ball will travel after contact with the object ball. The tangent line will also serve as the benchmark for determining whether you hit the cue ball with top English, middle or bottom English. For advanced pool players, you can practice all three options and understand the ball path after contact is made. The spider will go off 5 seconds after the object ball is removed from the cradle to conserve battery life, and comes on a soon as the object ball is place in the cradle correctly. The imaginary pool ball light can be turned off, leaving only the exact contact point required to make the pool shot – illustrated by a laser light. Improve your pool and billiards game with the spider. Each Spider comes with a hard-shell carrying case, batteries, 2 Spider clocks, and an instructional DVD featuring Jeanette Lee and Allen Hopkins. 1. Why can't I see the laser lights on the table? The laser line projections serve to indicate where a ball (object ball or cue ball) will travel under specific conditions. The visibility of the laser lines may vary depending on the lighting conditions over and around the table. 2. How am I supposed to use the green Cue Ball Circle? The green Cue Ball Circle indicates the exact position of the cue ball at the moment of contact with the object ball. This position is often known as the "Perfect Relationship". When shooting or rolling the ball over the cue ball circle with adequate speed, means that the shot is "replacing" the cue ball circle with the real cue ball. Aiming the center of the cue ball (with no left or right spin) at the center of the cue ball circle will cause the perfect relationship to occur. Aiming on “edge” of the real cue ball at the corresponding edge of the cue ball circle also will cause this to occur. 3. The cue ball does not follow the cue ball deflection line as I expected. What happened? The cue ball deflection line indicates a path that the cue ball will travel if it has no spin (top, bottom, left or right spin) at the moment of contact. Causing this to occur is very difficult. Many people think that shooting the cue ball easy with a center cue ball stroke will apply no spin. This is not true because the table cloth will apply friction that will cause the ball to have “top spin" (the ball rolls); therefore, the cue ball has top spin at the moment of contact. The cue ball deflection line should be used as a reference line that indicates (on one side or the other) the true path of the cue ball depending on the spin applied (top or bottom). The more “top or bottom” spin applied the further from the cue ball deflection line the true path of the cue ball will be. 4. How do I know I have placed the object ball in the correct position? None of the laser lights should come on until the ball is in the proper position. The real clue that you have “loaded” the object ball properly is to make sure you see a vertical laser line on the object ball. This is the contact point and will indicate you have it properly “loaded”. 5. I have the ball loaded properly, but I only see two (not three) laser lines on the table? 6. I can see the red laser lines but not the green cue ball circle? It is likely that the cue ball circle light on the dome is not activated. Push the cue ball circle button. If it is activated, a green light should appear on the button. 7. When I am using the green cue ball circle, where do I aim? From the video and instructions, the green cue ball circle represents where the cue ball must be at the moment of contact. To have a successful shot, the cue ball must “replace” the cue ball circle at the moment of contact. The aiming point is the “dot” in the center of the cue ball circle. Shoot (with center cue ball English) the center of the cue ball over the dot (the aiming point). 8. I “know” my cue ball is aimed and rolling over the center of the cue ball circle, but I still miss. Why? If you are truly “rolling” the cue ball over the center of the cue ball circle (the aiming point) and still missing, I would suggest that you are not hitting the cue ball in the center. From the instructional tape, learning the perfect relation ship of the cue ball and object ball at the moment of contact is the first step in maximizing the benefits of The Spider. Try this drill to see if you are hitting the cue ball in the center or applying “English” without knowing it. Place the cue ball on the table between two “diamonds” so that a line from one diamond through the center of the cue ball to the other diamond forms a 90 degree angle with the rail that the diamonds are on. Shoot the cue ball with center cue ball English striking the diamond at the opposite end of the table. If you are hitting center cue ball (important in using The Spider), the cue ball should return directs down the line from which you shot. If any spin, left or right, was applied, it will cause the cue ball not to return on the desired line. This drill is most effective when medium shot speed is applied (the harder the more obvious spin will be). Practice this drill until you “know” you are hitting center cue ball. 9. Will The Spider work on any size pool table? Yes, it is designed to work on any size or type of pool table. 10. 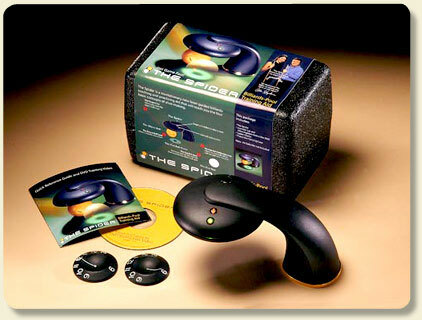 Can I use The Spider to practice with my snooker game? Today’s model of The Spider is for the United States’ pool. An American pool ball is bigger then snooker ball. Look for more information on the Snooker Spider on the Website soon. 11. Can The Spider help me with bank shots? It can help you in that it can show you if you hit exactly where you thought you needed to hit on the rail. 12. Is there a money-back guarantee? What is the warranty? The Spider comes with a manufacturer’s 1-year warranty. 13. Can I practice with the red lasers off? How do I turn them off? The Spider is not designed for use without the red lasers. The red lasers indicate that you have the object ball properly under The Spider, and the target line is pointing to pocket.